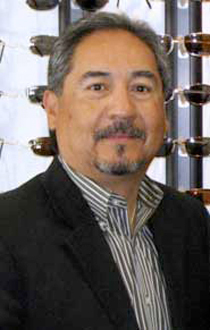 Miguel Avalos, A.B.O.C., is licensed by the American Board of Opticianry, and a fellow with the National Academy of Opticianry with training in the anatomy of the eye, lens design, frame and lens manufacturing. Miguel is also trained in adjustment and repair of different material frames as well as refraction, reflection, and absorption of lenses. He puts all his eyeglasses through a stringent 15 point inspection in a effort to provide you with the most accurate prescription fill possible. Miguel and his long-term employees, Gracie Bencomo and Debra Chavarria continue to stay abreast of new technology in order to provide Avalos Vision customers with the most exceptional service possible. With over 40 years in the Optical industry, Miguel has a vast knowledge, of frames, lenses, coatings, grinding techniques, and specialty products. After working for a wholesale lab in El Paso for 8 years, he moved to Las Cruces to manage the newly formed Pearle vision Center. 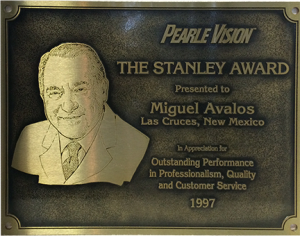 After managing the Pearle Vision at the Loretto Mall, and the Pearle Vision in the Mesilla Valley Mall, Miguel was offered the chance to operate the first Pearle Vision Center franchise in New Mexico. During the 15 years as a franchisee, he won 3 Paragon awards recognizing the best store in his region, and 1 Stanley Pearle award recognizing the best store in the country. In 1999 he decided to go independent opening Avalos Vision.